This traditional ottoman is great for adding style and comfort to your home. Its plush seat cushion provides a cozy resting spot for your feet, and even serves as an extra seat in your living room or family room. 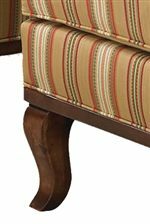 The exposed wood base and cabriole legs add the finishing touches to the classic style of this ottoman. Match with the coordinating lounge chair for a complete set. The 1416 Ottoman with Exposed Wood Cabriole Legs by Fairfield at Olinde's Furniture in the Baton Rouge and Lafayette, Louisiana area. Product availability may vary. Contact us for the most current availability on this product. Enhance your traditional styled living room with the classic style and comfort of this chair and ottoman. Exposed wood bases and cabriole legs add a sophisticated design, complete with an elegant curved, crown seat back and exposed wood arms. Plump cushions offer comfortable seating where you can truly relax. Create a custom look that matches your style and decor with multiple fabrics to choose from. The 1416 collection is a great option if you are looking for furniture in the Baton Rouge and Lafayette, Louisiana area. Browse other items in the 1416 collection from Olinde's Furniture in the Baton Rouge and Lafayette, Louisiana area.